All of our cakes are lovingly homemade right here at The Jolly Miller! 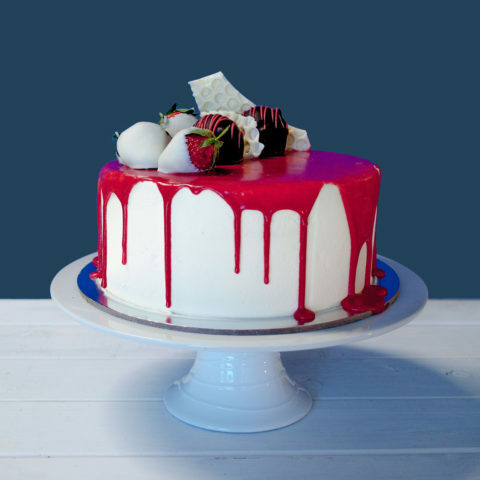 We can guarantee that each cake has the best quality ingredients, including all the TLC we can give, to ensure that your next celebration is a memorable one. Each cake is made to order so you receive the freshest of cakes to wow your guests. All you need to do is give us 2-3 days notice for your slice of magic! Just contact your local Jolly Miller cafe and speak to our friendly staff to order yours. Contains gluten, egg, soy and milk products. 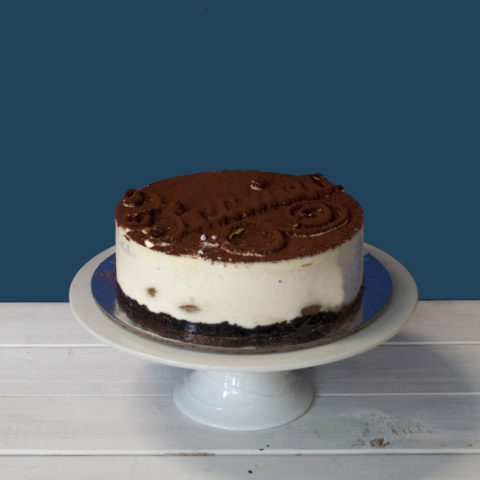 A rich chocolate mud cake filled with chocolate custard cream and chocolate flakes. Then a mask of chocolate buttercream and chocolate pour over ganache is added and topped with Tim Tams, wafer sticks, Oreos, a Fererro, a Peanut Butter Cup and a chocolate bar - a chocolate addicts weakness! Please note prices may differ between Jolly Miller locations. 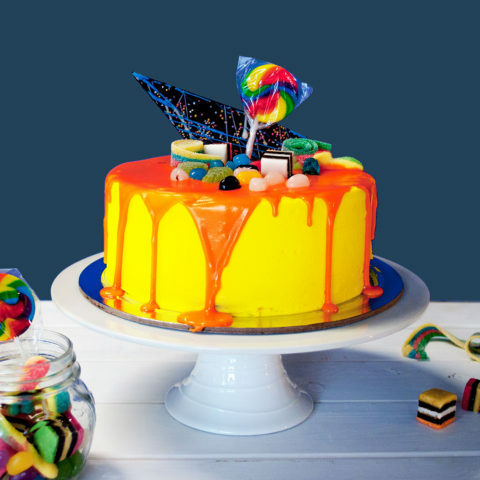 A moist blue, yellow and red rainbow swirl marbled cake filled with a yellow custard cream and then masked in a yellow buttercream and finished with a glistening orange ganache, topped with lollies and a lolly pop - a lolly lovers dream! 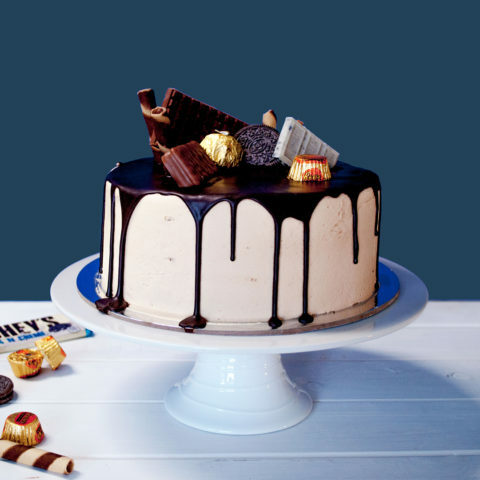 A rich chocolate mud cake filled with soft salted caramel and masked in a chocolate butter cream. 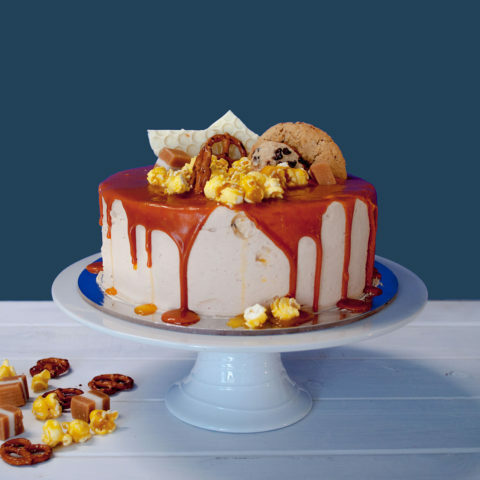 A caramel ganache pour over is then added and topped with a homemade mars bar cookie, popcorn, pretzels, jersey caramels and mini choc chip cookies - the most comforting of flavours! Contains gluten, nuts, egg, soy and milk products. A silky white mud cake filled with strawberry patisserie and strawberry custard cream, then masked with a vanilla butter cream. 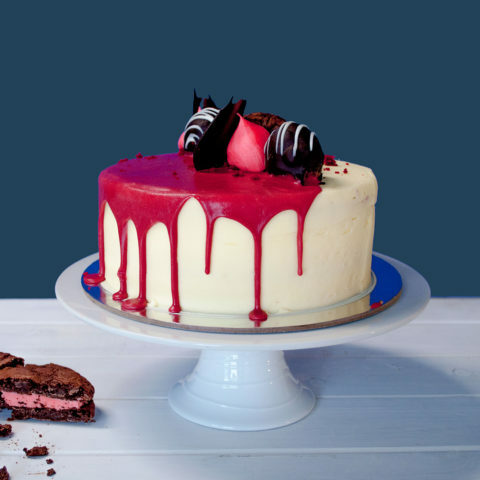 A glossy red pour over ganache is added and topped with chocolate dipped strawberries, pink macarons and white chocolate shards - a romantics dream! A rich chocolate mud cake filled with Nutella and hazelnuts, then masked in a chocolate butter cream. Finished with a chocolate ganache pour over and topped with Ferrero Rocher, choc balls, brownie cookies and hazelnuts - all the nutty goodness! A red butter milk cake filled with cream cheese icing and masked with a vanilla butter cream. A half pour over of a gorgeous red ganache topped with choc balls, raspberry brownie cookie and chocolate shards - a sinful indulgence! 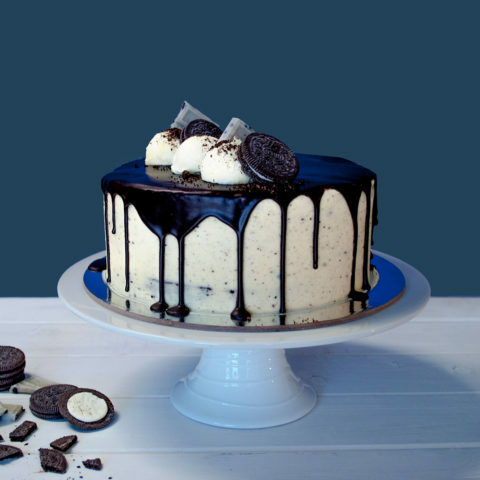 A rich chocolate mud cake filled with vanilla custard cream and crushed Oreos. 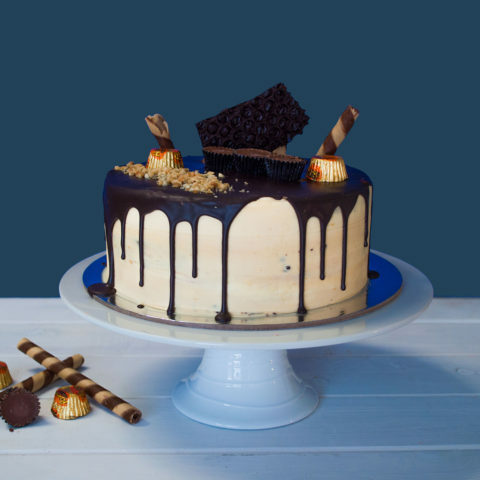 Then masked in butter cream and a chocolate pour over ganache and topped with butter cream domes, whole Oreos and a sneaky Hershey’s cookies & cream bar to top it off - a match made in heaven! 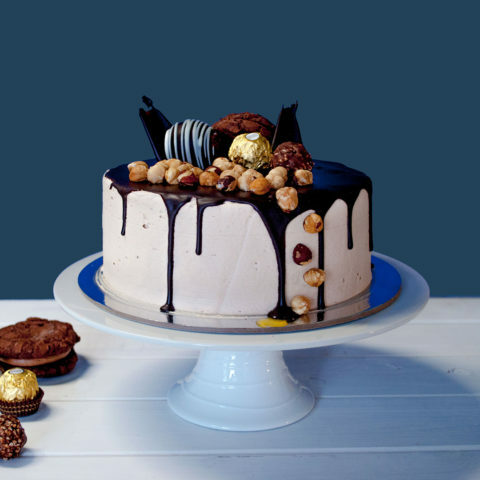 A rich chocolate mud cake filled with peanut custard cream and peanuts, and then masked with a creamy peanut butter cream. A ganache pour over is added and topped with Reese’s Peanut Butter Cups, chocolate shards and wafer sticks - great for peanut butter lovers! 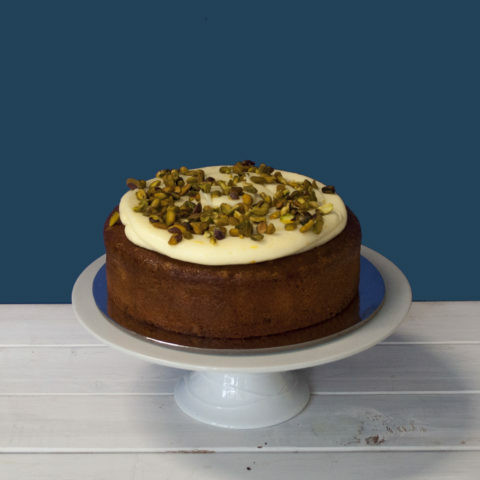 An orange and pistachio base made with almond meal and topped with orange zest cream cheese icing with a sprinkle of pistachios. It's delicious! Our Banana Cake is to die for! 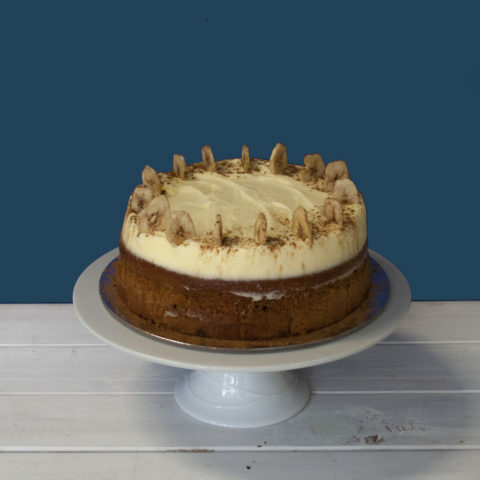 A moist banana cake base with a creamy cream cheese icing. Topped with banana chips and cinnamon. It's sure to turn your next party bananas! 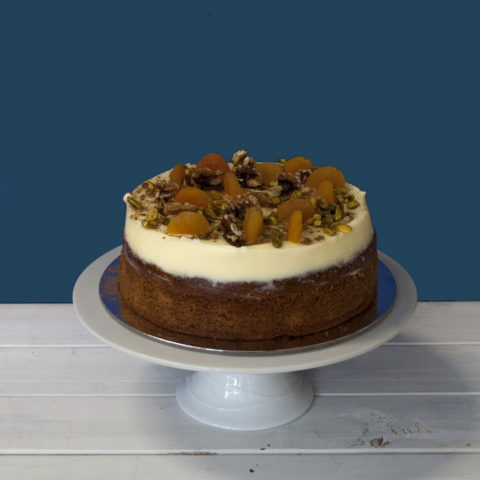 A delicious carrot and walnut cake, topped with cream cheese frosting and sprinkled with almonds, walnuts, pistachios and cinnamon. 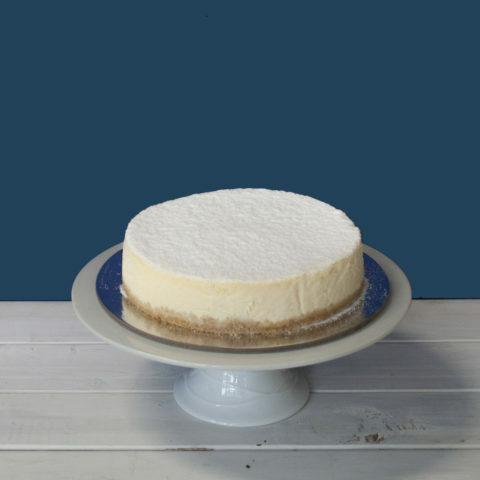 A smooth and creamy baked cheesecake for the traditionalists out there! So deliciously easy to eat it will be gone in no time. 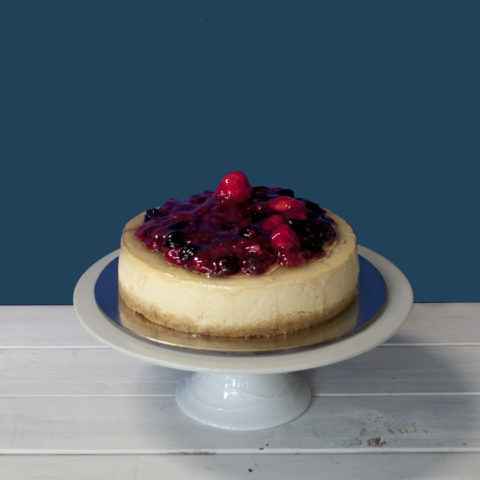 Everything you know and love with the New York Baked Cheesecake with a medley of deliciously sweet, wild berries added on top. Contains gluten, egg, soy and milk products. May contain tree nuts, sulphites and sesame. Contains Gluten, egg, milk and milk products. May contain soy, tree nuts, sulphite and sesame. 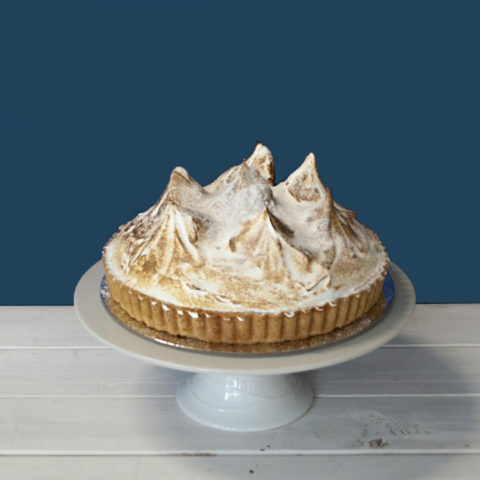 A deliciously tart lemon base with a sweet, fluffy meringue top. What more could you love! Contains gluten, soy, milk products. May contain tree nuts, sulphites and sesame. 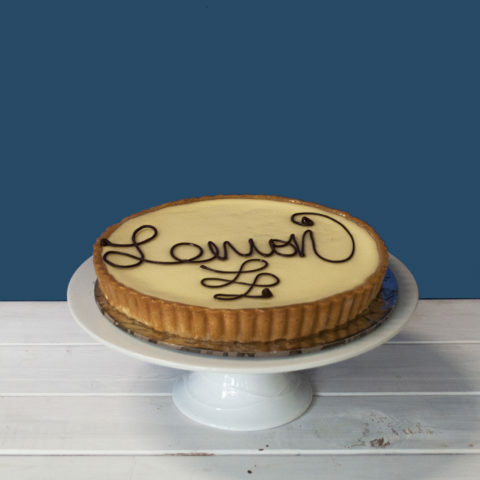 If you don't like all the fanciness of a Lemon Meringue Tart, then our Lemon Tart is for you! Let's face it, it's the best bit right. 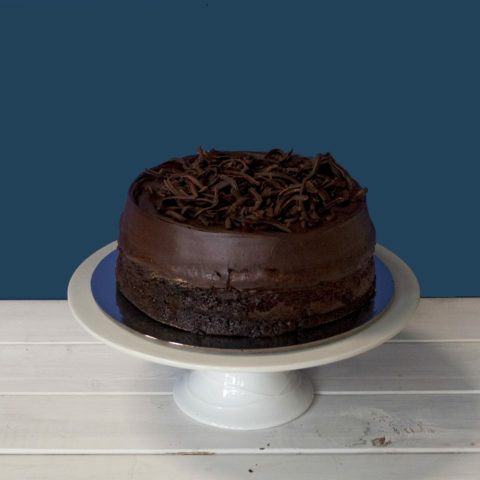 Our most delicious mud cake topped with the most decadent chocolate ganache icing and topped with chocolate shards. And it's gluten free!